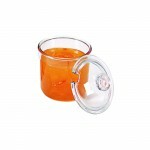 The Polycarbonate J-Jar 8oz is perfect for jams and chutneys. The lid of the jar has a hole for a spoon, spoon is not included. Sold singly.